Boxing gear is constantly evolving to provide fighters with the most help possible. Modern gear uses advanced materials to provide exceptional performance and comfort. With the right boxing gear, a boxer can improve in record time. But even beginners need the basics to use under a trainer’s careful eye. Every boxer dreams of making history and winning big titles. But it takes a lot of effort to go from zero to hero. Most people don’t have the special mix of time, determination and genetics to become the greatest fighter there ever was. The only way to find out if you have what it takes is to train as well as you can. Training harder and longer than everybody else is a good start. But you also need the right gear to train with or you won’t be ready to compete. 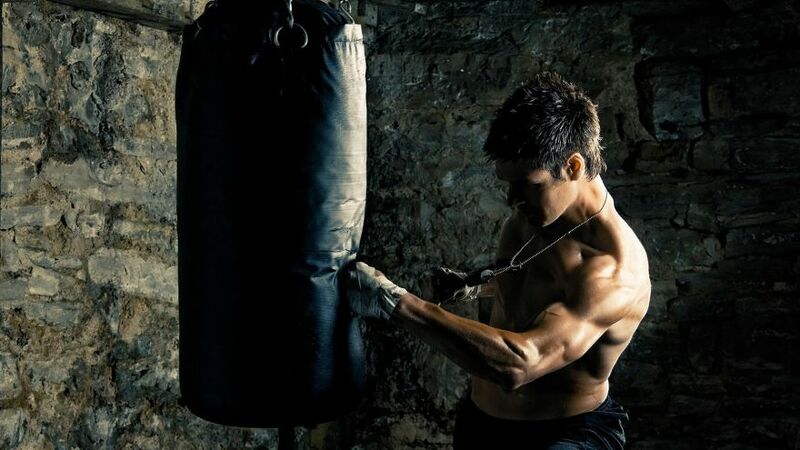 It takes more than a bag or some gloves to train in this martial art. But there aren’t many things that are absolutely mandatory but there are some. Below are some of the basics that every boxer needs in order to get the most out of their training. These tools and equipment are designed and honed to provide the right mix of exercises with the right amount of safety. After all, nobody wants to get seriously injured while training. The boxing world offers a vast array of options in each category below. So we will only touch on the big differences here. But we cover each piece of boxing gear in greater detail in our product reviews. So check out the links if you want to learn more. There are a lot of choices when it comes to heavy bags. Some of the biggest choices include free-standing vs hanging and weight. Every bag has both negatives and positives that allow boxers to choose a bag specialized for their goals. Freestanding bags are significantly more stable than hanging bags. Standing bags also tend to have their weight centered at the floor while hanging bags are closer to fist level. This makes standing bags better for hardening knuckles or grappling and hanging bags better for combo practice. With hanging bags, boxers also need to choose the right weight. If the bag is too light, it can swing violently from a heavy blow, making it harder to land proper combos. If the bag is too heavy, it can put undue wear and tear on your body. The best rule for hanging bags is to choose one that is ½ your weight. As the only part of your body that touches the ground, keeping your feet stable is of utmost importance. Boxing shoes help maintain control by anchoring feet without slowing down that explosive footwork. They remain light and tight throughout a match or training while allowing feet to breathe. The best boxing shoes feel like a custom glove for your feet. The shoes should also grip the canvas like sandpaper. There should never be any lumps or blisters, instead, they should feel molded to your feet once broken in. There is a variety of quality boxing shoes that provide a range of comfort beyond fitting your feet well. Quality materials and stitching provide significant wear compared to cheaper options. Make sure you are purchasing the best quality you can afford but also pay attention to the bells and whistles to get the truly best value for your money. Every boxer needs a pair of specialized trunks to train and compete in. These trunks need to be comfortable, snug and be the right length. Too short or tight and your movement gets restricted. Too long or loose and you end up tripping over yourself and fighting your gear instead of the opponent. Quality is also a major consideration when it comes to boxing shorts. Even though boxers don’t use their legs to kick, their shorts still get a lot of wear. The quick footwork needed to maintain positional control in the ring and the repetitive wear of training means that quality construction can increase the expected lifespan of a pair of shorts. On top of that, properly fit trunks ensure your skin stays dry and cool throughout the workout or fight. Moist pockets promote fungal and bacterial growth in areas prone to getting raw. The best materials dry quickly and wick away moisture. They should also slip easily without much friction, often referred to as “silky” because of how well silk glides across itself. The most iconic piece of boxing gear and what people know it for are the boxing gloves. Despite the iconic nature of the gloves, there are specific gloves for different situations. There are bag gloves, sparring gloves, training gloves and fight gloves along with the classic variants and plenty of weight choices. Bag gloves are designed to protect the hand while using heavy bags, double end bags, and other training tools. While protecting the hand, it also helps accustom knuckles to harder impacts by including minimal cushion. Modern gloves offer significantly more support and protection than classic versions. For sport boxers and beginners, modern gloves offer more safety than older styles. But advanced boxers know that modern gloves also offer a better response than older styles. This allows modern fighters to feel the difference between a good strike and a glancing blow more than ever before along with other feedback. Jump ropes are an important part of boxer training. The simple rope is surprisingly effective at targeting the muscles needed to throw a powerful punch. They offer a challenging endurance exercise that promotes explosive power and precision timing. Along with running, jumping rope is a key way that boxers train their endurance because of the variety of techniques possible. There are also a variety of rope weights that can increase the challenge of any routine. Boxers don’t throw kicks but they do rely on their footing. Jumping rope provides a great way for fighters to practice footwork basics with a pretty low impact. But it also helps build the shoulders and core muscles at the same time. This makes it one of the best pieces of boxing gear available. Protective headgear is a staple of modern boxing gear. Sports science done on NFL players, MMA fighters and boxers show that impacts have a cumulative negative effect on the brain. Protective headgear comes in levels of protection, comfort, and pricing. FIghting is intense and demands your full attention be on your opponent. Great headgear is comfortable, won’t annoy or distract you and softens blows. Because everyone is built different, what one person finds comfortable another finds small or large. Cushions become imperative once you get hit with a solid blow. But padding only slows you down until it stops an impact so there is a tradeoff. The best fighters often sacrifice protection for comfort because speed and relaxation offer the most protection. But even the biggest names understand the importance of protective headgear and wear it during sparring.